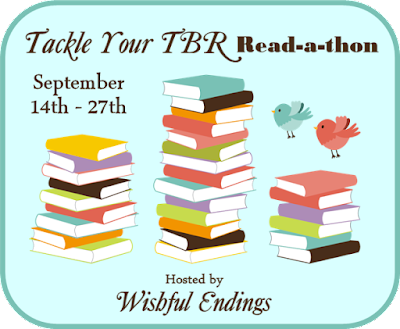 The Tackle Your TBR Read-a-thon is hosted by me (Tressa) here at Wishful Endings. It runs for two weeks, in which we all hope to have a blast with challenges, giveaways, and, most importantly, a ton of reading! Share your goals here. What are you required to do for the giveaway hosted here? 1. Post a sign-up or state your intent to join somewhere that I can find. It can include goals, but doesn't need to. 2. Post a wrap-up wherever you participate from stating how you did and how much you read. That's it. Participate as much or as little as you'd like otherwise. The goal is to read, read, read! Sign up using the linky below, if you haven't already. If you'd like to share your goals or let me (and all of us) know where to find them go to my goal post here. Don't forget to enter the giveaways below. This is the giveaway I personally host and doesn't require any sort of challenge. To be eligible you need to have signed up in the linky and post a wrap-up at the end. You can follow me for extra entries. Good luck on the giveaways! Let me know if you have any questions and let's get reading!